Contrary to the viewpoint of many Western scholars, the authors of this penetrating analysis argue that private farming is not a viable option in Russia's future. 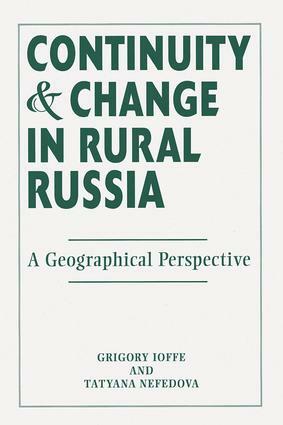 Instead, a convergence of Soviet-style subsidiary farming with traditional and reorganized collective farms is the most plausible path of evolution in most rural areas.Grigory Ioffe and Tatyana Nefedova arrive at this conclusion by a careful examination of ongoing reform efforts in Russian agriculture against the backdrop of European and Russian agrarian history and rural spatial development since the late nineteenth century. The comparisons at the national level are then filled in with consideration of a number of Russian provinces (oblasti) and regions (raiony). Their research reveals the substantial negative impact of rural depopulation on the Russian agrarian economy. Seventy original maps richly complement and support the narrative.